Congratulations! You have won the Shadow Poetry Silver award for your site. Your average score received from our panel of judges was a 88. We are so happy to honor web designers like yourself who have put many hours of hard work and determination into their sites. They are the ones that make the Internet a better place to surf with pleasing content and design. Again, congratulations on winning a Shadow Poetry Award. Your site has been reviewed by our judges. Congratulations! Your website "Barbara Tampieri Home Page" has met with the criteria needed to win our Historic and Cultural Heritage Gold Award! You have won our award for your useful art knowledge, professionalism and very excellent style of content. Congratulations, nobody deserved it more than you. Congratulations for being chosen as a winner of Circus World's award. You are the latest recipient of my Silver award. You have done an outstanding job creating your website. Thank you for submitting to my award's program. I mainly look at design, layout, and most importantly content. I played with each of your puzzles for the longest time. I feel I must also mention the artwork of the WTC by Karen Musick. The drawing was exceptional, almost to the point of bringing tears to my eyes when I saw it. I want to wish you continued success with your website. If you have any problem receiving the award, feel free to notify me. I found your site to be just beautiful, with stunning design, and lots of wonderful content! Thanks for applying for this award. Congratulations! Barbara Tampieri Home Page has been selected to receive the TMC Exceptional Design Award. Your site was submitted to Altscape.com for consideration of the 'Altscape.com Top10 Internet Award'. After conducting an extensive review of a great many web sites (yours included), I'm happy to announce your site has been chosen as one of only ten Award Winning Entries. I therefore have great pleasure in bestowing upon your well designed web site the 'Altscape.com Top 10 Internet Award'. Congratulations again on an incredible web site, well done!" Thank you for applying for the Pegasus Gold Web Award. The purpose of our award is to recognize the effort some of you put into creating the pages and to encourage webmistresses and webmasters in further development of web creation. We conducted an extensive review of your web site and we have found it to be eligible for our award. Thank you for applying for the Pegasus' Web Award and also thank you for giving us the opportunity to review your site..
your sites represented themselves as an artistic portal...you showcase the art-work of your father and painter Giuseppe Tampieri in a wonderful hommage. The dolomites are presented with exceptional photographies and I must confess they reminded me of a beautiful holiday I spent in Italy some years ago. All in all I liked your homepage very much and I want to honour your artistic work with my Rosensilber for the Month November. I am pleased to announce that your web site, "Barbara Tampieri Home Page" has won the iNet Bronze Award! Congratulations! We applaud the important work you are doing in providing a gallery for artists to get additional and valuable exposure for their work. You continually showplace beautiful and original works that are a joy to view. Your site is exceptionally designed and executed and it is always easy to access from whatever corner we chance to peek around. Your award program continues to give back to the Web community in a big way and is appreciated. We congratulate you on a job well done and look forward to seeing more great work from your featured artists. We thank you for applying for the iNet Award and for allowing us the pleasure of reviewing your web site. Enjoy your award. You've certainly earned it! Congratulations! 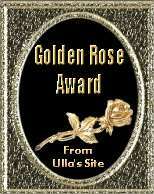 Your site has been chosen as the winner of the "Ulla's Site Golden Rose" Award. You have a wonderful website, very professionally designed. I enjoyed it very much. it has been a pleasure to review your website. Your outstanding website has a perfect navigation, interesting contents and very fine layout. I like your fabulous quality photographs and I enjoyed to play with your puzzles. Your international Award Program is great, too. Thank you for applying my Falter Award and keep up the great work.